Chemical-free cleaning is becoming more and more popular. But today’s post goes way beyond homemade laundry detergent and DIY fabric softener recipes. Lately, everyone’s talking about using tiny beads to clean clothes in your washing machine and to clean dishes in your dishwasher. I’m one of them. I recently purchased a set of laundry balls and a dishwasher disk. Both of these products are filled with tiny cleaning beads that magically remove stains and odors without using ANY detergent! You’ve probably heard the chatter about polymer beads, ceramic beads… and even a washing machine that uses beads and hardly any water to clean clothes naturally! It really is amazing. You can get hundreds of wash loads from a single set of cleaning beads. Best of all: the Xeros washing machines use reusable nylon polymer beads to cut water usage by up to 80%. The nylon polymer beads have an inherent polarity that attracts stains in a similar way to how your white nylon garments can get dingy over. However, under humid conditions, the polymer changes and becomes absorbent. Dirt is not just attracted to the surface, it is absorbed into the centre. After the water dissolves the stains, the dirt is absorbed into the center of the beads, where it remains trapped. After the cycle is complete, the beads are spun out of the load through holes in the drum, where they then return back to s sump pump and are reused. So it’s pretty clear that using polymer beads for cleaning is the way of the future. Good news: the future is now! You don’t have to go all out and invest in a new washing machine. Instead, you can get some laundry balls or dishwasher disks which are filled with cleaning beads and see for yourself. Here’s a little about the products with cleaning beads that I got for my washing machine and my dishwasher…. Currently, there are only a handful of manufacturers who have developed products with cleaning beads for consumer use. The beads inside these washer balls use bio ceramic technology. 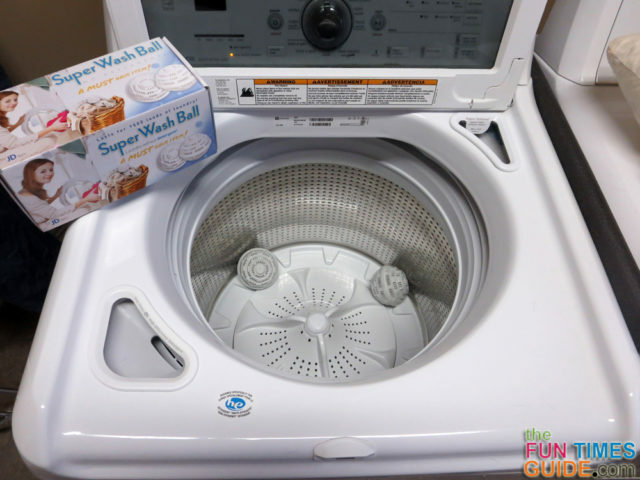 You simply toss both of the laundry balls inside your washing machine before running each load (with NO detergent, bleach, or fabric softener added), use warm or hot water, and enjoy clean clothes without all the mess. That’s it. You can still pre-treat stains, if you wish. Each laundry ball is about 4 inches in diameter. They’re fairly hard to the touch, but have a little bit of give to them, and they’re not breakable. Nor are they noisy in the washing machine (like some dryer balls can be). You get literally over 1,000 uses from each set of washer balls. Actually, the product packaging itself states that you get 1,100 wash loads from this set of Super Wash Balls. Best of all: no more detergent — ever! Just to clarify… these are not scented products for the purpose of making your laundry room smell great (like those scented laundry beads that are also quite popular right now). No way. No how. In fact, these cleaning beads are completely unscented. You have to use warm water (preferably hot) in order for the cleaning beads to work effectively. I’ve always used cold water for most of my laundry loads — to avoid shrinking anything. But I’m willing to switch to warm water for the longterm benefits of using these cleaning beads. 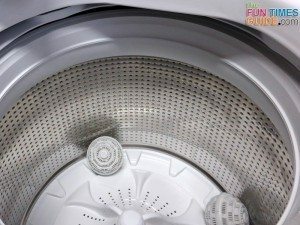 The cleaning beads aren’t as effective as detergent when washing whites. This is a bit of a bummer, but fortunately in our household we wear dark colors more than white and light colored garments. Whenever I wash whites now, I just pay more attention to pre-treating any stains ahead of time. There’s no scent at all — which is fine for me, but not for everyone. Sometimes we think if something smells better then it’s cleaner than it was before. It really difficult to tell if these washer balls are cleaning better (or worse) than my old detergent did. I can’t help but wonder if I’m basically just cleaning with water alone. Unfortunately, I can’t find many experts talking about the cleaning effectiveness of these types of products. And my husband and I’s clothes are rarely super-soiled, so we’re not a great test. I do like how you can basically ‘recharge’ these laundry balls and boost their effectiveness by setting them out in the sun to completely dry out every 6 months or so. Doing this will eliminate any of the odors that the beads themselves have removed from your garments and held onto after repeated use. Watch the video and read reviews from others who’ve used these laundry wash balls. Generally speaking, when you use laundry balls with cleaning beads, you get all the cleaning power of detergent but with the principles of bioelectricity and hydrodynamics instead. While it saves money in your pocket, time will tell if this is truly an effective cleaning method or not. 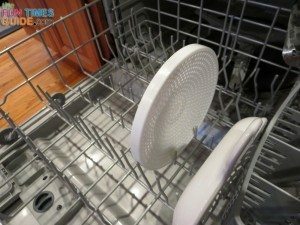 The Super Wash Dishwasher Disk that’s filled with bio ceramic beads is 7-1/2″ x 1-1/4″ in size. It’s also made by JD Items TX. I haven’t found any other dishwasher disks that are available elsewhere. You simply place this disk inside your dishwasher where you would normally put a plate. Leave it there, load after load. Add your dishes inside the dishwasher like usual, time after time. The dishwasher disk continues to clean your dishes — without detergent! According to the manufacturer, you get 1,000 uses from each dishwasher disk. 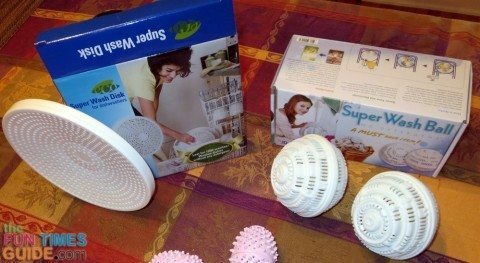 As with the Super Wash Laundry Balls (above), you can ‘recharge’ the Super Wash Dishwasher Disk to boost its effectiveness by setting it out in the sun to completely dry out every 6 months or so. Doing this will eliminate any of the odors that the beads themselves have removed from your dishes and held onto after repeated use. Watch the video and read reviews from others who’ve used these dishwasher disks. UPDATE: Oddly enough, I got a letter in the mail from QVC about the same time I was ready to start using the Super Wash Dishwasher Disk. Here’s what it said. That letter, combined with the poor reviews of the dishwasher disk on QVC online, led me to conclude that this product is probably not all it was said to be. Plus, as stated above, I’m not 100% sold on the effectiveness of the Super Wash Laundry Balls — which use the same technology and are made by the same manufacturer. 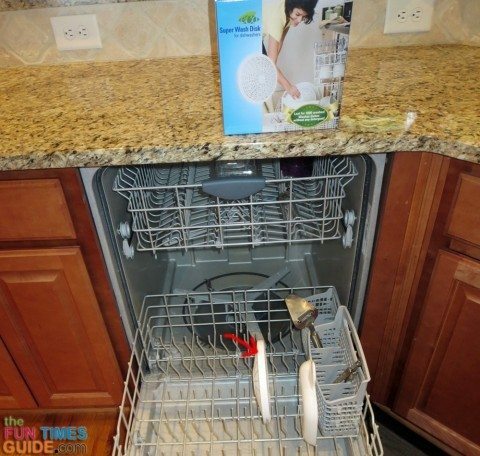 Since food on plates, pots & pans, and silverware would be much more difficult to remove than body oils from clothing, I decided to take QVC up on their offer and I returned the Super Wash Dishwasher Disk. For what it’s worth, I’m still using the Super Wash Laundry Balls with every load that doesn’t have heavily soiled garments, but I see myself switching back to traditional laundry detergent that’s been proven to be effective in the near future. How Effective Are Cleaning Beads? Since cleaning beads work by changing things like alkalinity and the pH level of water — as well as the amount of chlorine and the softness of the water — I would think that people with hard water would have a different experience than people with soft water… or even well water. Since water varies from household to household, we all have a different base level that we’re starting from. Therefore, it’s quite logical that results will vary. It’s similar, in theory, to adding chemicals to a swimming pool or hot tub. When we lived in one neighborhood, I had to add a whole different combination of chemicals to the water in order to achieve the correct chlorine, pH, and alkaline levels than I have to do in our current neighborhood, which is just 12 miles away! Only time will tell if it’s those with harder water or those with softer water who will feel the benefit the most from these cleaning products that use polymer beads, bio ceramic beads, and other types of cleaning beads. While this next item does not have the cleaning beads inside, it is yet another item I purchased about the same time to make doing laundry easier: Dryer Balls with scented aromatherapy sticks inside. Dry your clothes faster …than not using dryer balls. However, old-fashioned dryer balls do the same thing. Eliminate the need for liquid fabric softener — because they’re scented and — like all dryer balls — they reduce the amount of static. Add a fresh scent from a healthy source: all-natural essential oils. I already use essential oils in my everyday life, so this was a natural fit for me. Reduce static cling …probably not as well as dryer sheets though, to be honest. Eliminate the need for dryer sheets. This is the biggest reason that I bought them – to save a lot of money over time! I got the pink ones (Spring Blossom scent) because the blue ones (Clean Linen scent) were sold out at the time. But I’m not picky, I’d be happy with either set. I don’t get too hung up on fragrances like some people do. The only downside, in my opinion, is the fact that these dryer balls are noisier than most. 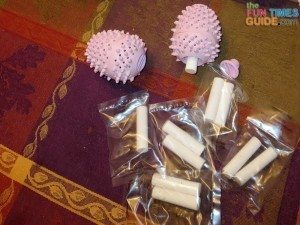 I’ve had a set of the regular, old-fashioned dryer balls for years. Those are what I would call mildly noisy. These are double that, in terms of noise. They are fairly clunky in the machine. (I wonder if it has anything to do with the fact that they’re not perfectly round like most dryer balls are.) Fortunately, my laundry room isn’t near our main living space, so the noise isn’t too intrusive. 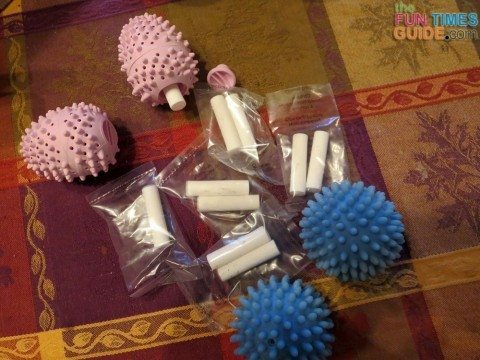 One tip: The aromatherapy sticks that you place inside these dryer balls are very strongly scented! (But isn’t that the point?) If it happens to be too much for your liking, simply put the scented chalk in only one of the dryer balls, while still using both dryer balls per load. You’ll still get all the same benefits with half the scent! 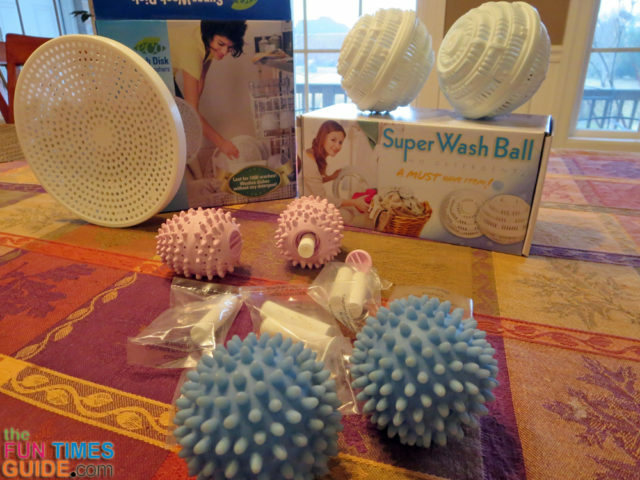 Watch the video and read reviews from others who’ve used these dryer balls. Here are lots of other dryer balls to choose from as well — mostly unscented.